My youngest Grandson, Brayden will be turning 2 years old next month, so this challenge was perfect timing for me! I decided to go ahead and make a birthday card and gift bag for my sweet boy. * I started with a red cardbase and used a Spellbinders die to create the pretty edge along the bottom. 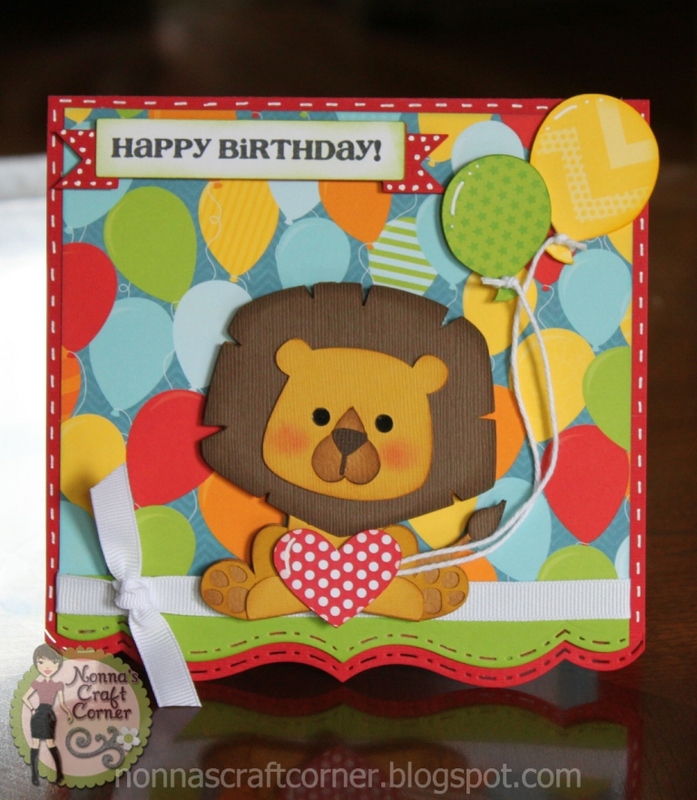 * The sweet little lion is from the "Safari Love" cutting files by Lisa at Pretty Paper, Pretty Ribbons. 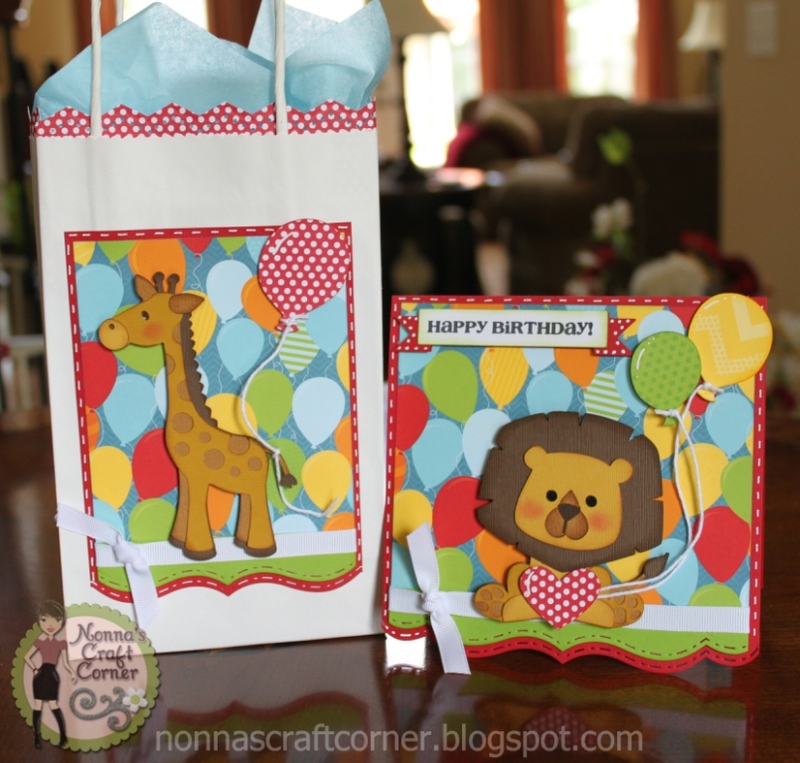 I added some fun balloons using the "Birthday Panda" cutting files also by PPPR. * I started with a plain white gift bag - I try to keep a supply of white and kraft gift bags on hand all the time. They are perfect to dress up for any occasion. *I cut a strip of the polka dot paper to fit around the top of my bag (about 2.5 inches in width). I used a MS paper punch to create a pretty edge and glued the strip to the inside of my bag. * Using the same background papers on my card and bag helps to tie everything together. 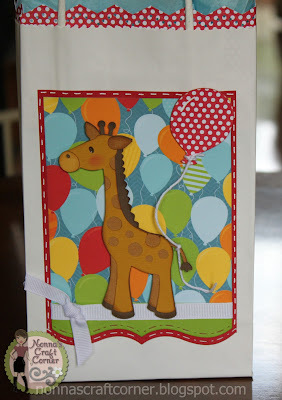 * This time I used the darling giraffe from the "Safari Love" cutting files by PPPR. I changed out the heart shaped balloon on this image for another round balloon to keep things consistent. * I used the new "Totally White" twine by Trendy Twine on all the balloons. I think I covered most of the details on this project - hope I didn't put you to sleep! I hope you are able to play along with this fun "Child's Birthday" Challenge this week. Go, get creative and be sure to link up your project over at Craftin Desert Divas. I can't wait to see what you create! I have really missed entering some of the fun challenges going on and would like to start playing along when I have a chance. So, I am also entering this project into the "Use Pattern Paper" Challenge going on over at Paper Playtime. These are so adorable Tanya. These are too cute Tanya!!!! LOVE the adorable cuts and GREAT birthday theme!!! Another awesome project! Love, love, love it! Great bag and card. The colors are so cute and it a perfect set! Adorable! Love that balloon paper...super cute! Cute, cute, cute set you have here. Love the papers and those cuts are precious. Love it. Absolutely adorable! Your grandson is going to love them. Thanks so much for being a guest designer. This is so cute and I just love the papers you used. Congrats on your GDT. Both are so adorable...love the colours and design!!! I always enjoy seeing your project posts pop up on my daily Bloglovin' email feed. Thank you for playing at Paper Playtime. Your project is featured on our Facebook Page today and linked to your blog! This is super cute, Tanya. I love those sweet animals. The bright paper just screams fun and birthday. Me again...you already know that I think these are too cute...thanks for playing along with us at Paper Playtime!! Such a super sweet set Tanya!! I love the bright colors of the papers and I am sure your grandson will love those adorable anmimals! Tanya, this is over the top cuteness! The set is just adorable and love the papers and the animals are so darling! These are so sweet. What a great set. TFS. This is absolutely PRECIOUS!! Love it! !